Taste test: These are crunchy kettle-cooked chips. Considering that they're labeled "lightly salted," I was quite surprised by how flavorful the chips were. The salt level was not consistent from chip to chip, and some of the chips actually tasted like they had more salt than your average chip. This would, of course, make them heavily salted lightly salted chips. They're good chips, but they not nearly as good as Cape Cod chips, which remain the standard-bearers of kettle-cooked chips. Smell test: A bit oily. 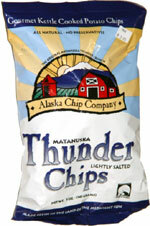 This snack was discovered by Sam (Nancy's friend) in Alaska. Review published .